Add flour, egg, salt, and some vegetable oil to a large bowl and start to combine using a hand mixer with dough hooks. Add water and keep mixing until all ingredients come together, then knead by hand for approx. 8 – 10 min. The dough should be shiny and smooth. Let it rest in the bowl at room temperature for approx. 30 min. In the meantime, peel and finely dice onions and brown mushrooms. Finely chop parsley and sauerkraut. Heat remaining vegetable oil in a frying pan and fry brown mushrooms for approx. 4 – 5 min. Add onions and keep frying until they are softened and pale golden in color. Add sauerkraut and season with salt and pepper to taste. Flour your work surface and roll out the dough until thin, approx. 2-mm/0.08-in. thick. Cut out discs with a glass. Set aside approx. 3 tablespoons of the filling. Place 1 teaspoon of the remaining filling in the center and carefully fold the dough over, pressing with your index finger to seal and create a pattern around the edges. Repeat with the remaining dough and filling until used up. Bring salted water to a boil in a large pot, add bay leaves and carefully slip in the pierogi. Let cook at a rolling boil for approx. 3 – 4 min. Remove from the pot using a slotted spoon. Melt clarified butter in a large frying pan. Fry pierogi in batches until browned. Add remaining filling and half of the parsley and keep frying for approx. 3 – 4 min. 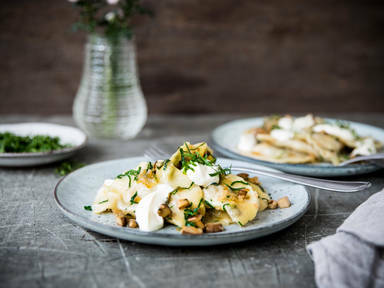 Serve pierogi with light crème fraîche, remaining parsley, and fresh black pepper.